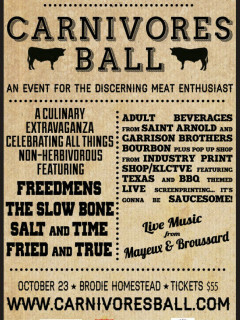 One of the preeminent events for meat enthusiasts, the Carnivores Ball returns for 2014 at the elegant Brodie Homestead. Guests will be treated to a multi-course spread curated by barbecue aficionado Jess Pryles, which includes local establishments including Salt & Time and Freedmen's, and even a taste of Australia with beef shipped over from Condabri. Along with beer pairings for each meal from Saint Arnold, the Carnivores Ball will have much to offer for meat-loving foodies.